I bought a Pine64 couple of years ago and haven’t put it to much use besides doing some basic testing of how it works. I have been following their development process and forums and feel that the Pine64 team has failed to cope up with the user demands for accessories or support with third party accessories. For example, they only offer one 7″ size touch screen which is a very common Chinese panel, but is always out of stock on their website. Also, to stop users from buying it directly from stores like AliExpress, they have changed the pin-out of the digitizer. There are no alternatives or bigger size panels available. I had been searching for a cheap screen option for my Pine64 and there was no support for the touch screens till lately. This guy here had an image of his officially sold 35$ touchscreen model G07021AB01B6. While, this official display datasheet has a model No: FY07024DI26A30-D. Doing some googling around these models, I stumbled upon this link, which lists some 70 alternative model numbers of these LCD panels which are sold/made in China. Though many users on the forum confirm that the LCD panel works, problem is with the touch panel. The touch panel compatible with the above list of LCD panels has a 6 Pin connector with default/common pin out. However, Pine64 team has modified it making all the cheap and easily available digitizers from China incompatible. 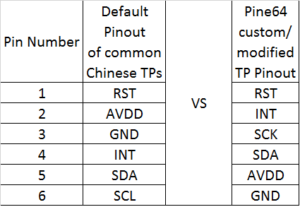 Above table shows the Pin out difference. Forum user Airtau has designed this Converter Board which can be used to match the Pin outs on the Common TP to Pine64 custom Touch Panel. The design is public on Easyeda here. So, to have a working LCD/touch screen for Pine64 you need following 3 custom parts. This G07021AB01B6 or this FY07024DI26A30 or any of the 70 touch panel models numbers from the excel sheet list above. This Touch Panel to mate with the LCD matrix above with Goodix GT911 controller. 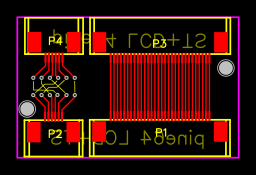 This Converter board for matching touch panel Pins with Pine64’s TP connector (This board needs to be fabricated/built and assembled with connectors). Here’s a link to the PCB GERBER files. Note: I have not tested this solution. I wrote this post just to compile all the information at one place which is available out there on different forums, blogs, etc. In case you have more information around this, please leave a comment below and I will update the post. Great summary thanks a lot! The only problem is the converter board if you don’t have access to a cnc machine. Do you know if there is such a board available on the market? NOt available ready made, as far as I know.